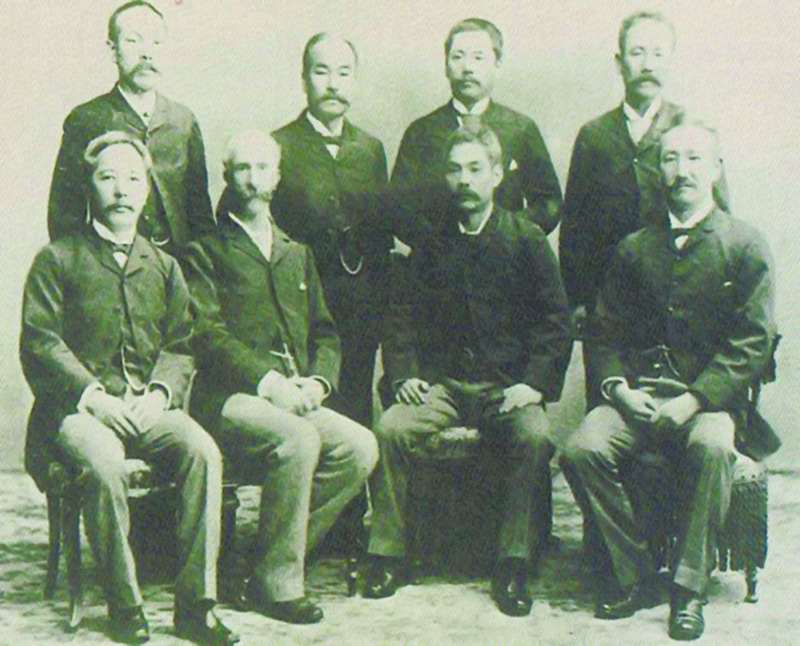 Top class: Glover with key former samurai players in the new, modernizing Japan after the 1868 Meiji Restoration, including (to his left) Yanosuke Iwasaki, who had taken over the Mitsubishi company his late brother, Yataro, founded in 1873 with a lot of help, and cash, from Glover. This coming Friday, Dec. 16, 2011, marks the centenary of the death in his opulent home in the Shiba Park area of Tokyo’s central Azabu district of the Scottish-born trader Thomas Blake Glover, who became the first foreigner ever decorated by the Japanese government when he was awarded the Order of the Rising Sun (second class) in 1908. Despite that remarkable distinction, however, Glover’s life and his contribution to the creation of modern Japan and, unknown (but not unsensed) by him, to its ultimate humiliation in 1945, has registered only unevenly and with some unease in today’s still often palpably postwar Japan. And that despite it being a tale of such ambiguities, such outright roguery and cutthroat capitalism — and yet of such vision, too — that it beggars belief it has not already had the “Last Samurai” treatment. For sure, the traditional live New Year’s Eve “Kohaku Uta Gassen” (“Red and White Song Battle”) televised by national broadcaster NHK was, in 2009, partly screened from Glover House in Nagasaki, his long-time home that was the first Western-style building in Japan — and which, in the British fashion, he gave a name to upon its completion in 1863: “Ipponmatsu” (“Single Pine Tree”). In popular culture there has, too, been a flutter of increased interest in the 1868 Meiji Restoration of the Emperor and the overthrow of the feudal Tokugawa Shogunate’s military government that had been in power since 1603 — a momentous national turning point in which Glover played an absolutely crucial role. For all that, and despite the fact that Glover House now gets 2 million visitors a year, including many on school trips, there have been no serious historical dramatizations of Glover’s remarkable life and role in history, even though there is a background enthusiasm for his modernizing energy and willingness to negotiate in unfamiliar and dangerous surroundings. It is hard to avoid thinking that some still worry in case his career might reveal more than many would like to know about modern Japan. After all, much of the typology of “race” still commonplace to this day, and the free-trading and civilizing empire the nation embarked on carving out in the 20th century, can be traced back to the encounter between voracious traders, among whom Glover was foremost, and modernizing samurai eager to overthrow the old, clan-based order and unify Japan under its Emperor kept in the old Imperial capital of Kyoto as a symbolic puppet of the shogunate whose base was far to the north in Edo (present-day Tokyo). Is it perhaps that the desire to lay bare the sheer adventure in his life is overpowered by the purely Japanese realities of his time? Whatever, his was a life spent almost entirely in Japan, from 1859 until his death, and in his time he contributed enormously to its development — in some ways that turned out to be better than others. 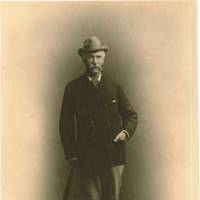 Glover was born on June 6, 1838, in Fraserburgh in the Scottish county of Aberdeenshire, to an English coastguard father and a Scottish mother, the fifth of seven children — six sons then a daughter. When the boisterous young Glover was around 10 or 11, his family moved from that port town where, through brothers working as shipping clerks, he already had a flavor of the quick money to be made doing deals with fishermen and timber traders from far-flung lands around the Baltic, to the nearby fishing and shipbuilding city of Aberdeen. 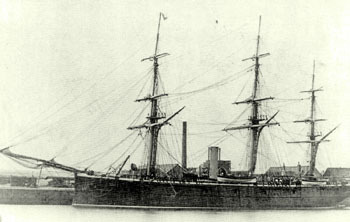 As the family’s finances only enabled the eldest son to go to university, after he completed his basic schooling in 1854, Glover took a job as a trainee shipping clerk in Aberdeen. Soon, though, his free-spirited business acumen caught the attention of the huge Jardine Matheson Far Eastern trading company formed by the Scotsmen William Jardine and James Matheson in Canton in 1832. 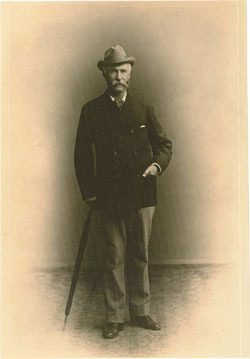 In 1857, when Glover was 18, he was taken on and soon after posted to Shanghai. As contemporaries noted, it was as a well-built, well-mannered but no-nonsense young man standing just 168 cm and weighing 59 kg that Glover first set foot outside Britain. He arrived that year during the Second Opium War, a conflict engineered from Britain to open the whole of China to free trade — in particular as a limitless market for the opium being produced in vast quantities in its Indian Empire. The war had been lobbied hard for by Jardine Matheson at a time when China had become a hugely lucrative part of Britain’s informal, unoccupied empire on which it had imposed rapacious trade treaties. 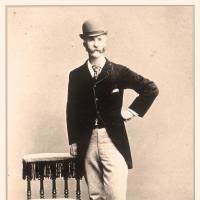 After performing well for two years selling opium to local middlemen, and trading in silks, tea and guns, Glover had reportedly already developed the gruff, imposing presence necessary to those in his position so far away from home — as well as the clout to command his own cut of the deals he was doing for his employer. But following America’s opening of Japan with U.S. Cmdr. Matthew Perry’s “Black Ships” in 1853, and its imposition the following year of one-sided trade treaties on that nation previously closed to outsiders for more than 200 years, Glover was not slow to join a trickle of the bravest Shanghai traders and move to that fearful country to the east. When he arrived in Nagasaki in 1859, aged 21, Glover was at first alloted accommodation in the city’s concessions area, called Dejima, where he would soon build up a mini-empire of real estate. In 1861, he founded Glover Trading Co. (Guraba-Shokei) to deal illegally — nay, virtually treasonously in light of a commerce treaty signed in 1858 between Britain and the shogunate — in ships and weapons with the rebellious Satsuma and Chosu clans in Kyushu and the Tosa from Shikoku, who were all bridling in those tumultuous times against the policies of the so-called bakufu government of the shogunate. However, by necessarily living warily as he had little if any legal protection from any side, and by becoming a master at playing off against each other rival forces among the clans and between them and the bakufu, Glover not only survived, but he prospered mightily in his first eight years in Japan that were spent prior to the Restoration watershed in 1868. Others were not so fortunate, and in the many sporadic conflicts between rival clans, between clans and the shogunate, and sometimes between clans and foreign residents, many, including foreigners, were killed. In a sense, the British government watched this with eyes half-shut, in an era when diplomatic missions would often follow in the wake of the more aggressive entrepreneurs when it had become safer to do so. Newspaper records show traders occupying the front line, yet with officials avoiding admitting their history-shaping power. Consequently, Glover scarcely ever appears in diplomatic histories, and not at all even in the memoirs of his collaborator and friend, the distinguished British diplomat and Japanologist, Ernest Satow, despite the two young men sharing a crucial role in building relations with samurai rebels that would ensure Britain a favored position after the shogunate’s overthrow by them in 1857. But Glover and the other pioneering traders thrived in this role of semi-authorized trade piracy. And so it was that, while never trying to foist opium on Japan — thanks to his understanding of the bushido samurai spirit — and lacking the medical and technological expertise largely then the domain of the Dutch in Japan, he turned instead to arming the main rebel clans both against overseas enemies and each other — as well as, in a reality he well understood, against the central bakufu government. Then, after terribly one-sided, punitive British naval attacks on Kagoshima in Kyushu in 1863 and the key naval port of Shimonoseki near Nagasaki in 1864 — following the killing by samurai of a few British citizens — it became clear to all in Japan that a new, Western mode of warfare had arrived and that it was a matter of urgency to acquire sidearms, rifles, machineguns — and warships — before any sort of defense could be mounted against the foreign barbarians, as was the commonly held view of such outsiders. Like it or not, Japan was already part of a new geopolitics — and Glover was up to the challenge as, during the 1860s, he became Kyushu’s biggest arms dealer. Kyushu in turn was able to establish itself as Japan’s most dangerous and volatile political region, with rebel clans increasingly disobeying the bakufu retinue surrounding the Emperor in Kyoto or the shogunate based in distant Edo. As a lifelong imperialist royalist, Glover could naturally (albeit very profitably) relate to those clans describing themselves as more loyal to the supreme symbol of Japan, the Emperor, than either of the two bakufu groupings in Kyoto or Edo. But when those clans led the overthrow of the shogunate and in 1868 restored the Emperor Meiji to supreme authority in the state, Glover’s world too was transformed. With Japan now more open than ever before for trade with the world, the market for his weaponry soon became saturated as the new Meiji administration assumed sole control of acquisitions, while many of his old trading and drinking partners took up managerial positions. However, though his direct political influence waned, Glover’s connectedness and his experience brokering the building and sale in Japan of ocean-going ships guaranteed a favorable role for him under the new regime. 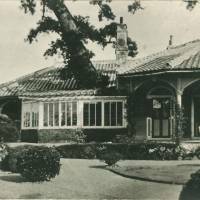 So, by the end of his life, and despite a bankruptcy in 1870 after he started to develop Japan’s first modern coalmine, on Takashima Island in Kyushu, Glover was living in some opulence in Tokyo, where he would die never having set foot again in Britain since leaving. 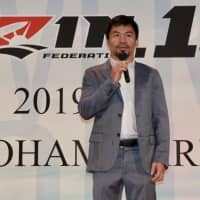 He had, too, his “Ipponmatsu” home in Nagasaki, the city where he is buried in the Sakamoto International Cemetery, a son by one mother and a daughter, who moved to Korea, by another. And he had built up a loose network of powerful friends who knew him as a tough businessman, a fairly heavy drinker and a reckless international broker. Glover’s first fortune came from property, currency speculation, refired (black) tea (kōcha, as it’s known in Japan — even though this means “crimson tea”), and general trading — but overwhelmingly from guns and warships. He cast around restlessly for projects, but the real profits he always came back to reap were in weaponry. So, after the post-Restoration collapse of his business in small arms, rifles and machineguns, Glover changed tack to focus on warships and ship-brokering as his career staples. In this, he often worked closely with his brothers, who all developed Japanese connections — and indeed, his every surviving sibling would eventually spend long periods in Japan. 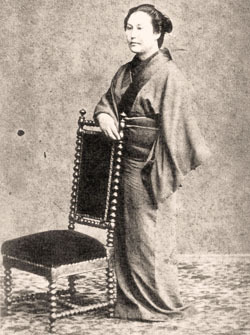 Meanwhile, Glover’s pragmatic attitude and his survival instinct during the turbulent lead-up to the overthrow of the Tokugawa Shogunate in 1867 had brought him close to Ito Hirobumi, later the first prime minister; Inoue Kaoru, later the first foreign minister; and to the Satsuma strategist Godai Tomoatsu; and many others destined for Meiji government office. In fact, Glover was involved in a minor way in helping the influential Choshu Five — radical young samurai who would be among the country’s first statesmen — to defect their closed country in 1863 aboard Jardine Matheson ships for education in England. Then, two years later, he was even more directly involved in hiding and smuggling abroad for technical training the so-called Satsuma 18 under Godai Tomoatsu, some of whom settled in Aberdeen. Many of such friends and co-collaborators as these who were to come into power following the Restoration would remain with Glover for decades, even despite growing and confused pressures from the 1880s drawing them back — in the face of pell-mell modernization and unsettlingly sudden internationalization — to “traditional” (in fact largely newly invented) national values. These included the ideas of Yamato damashii (Japanese soul or spirit) and datsua, (literally, “escape from Asia”; the Meiji Era policy of Westernization that drew on a sense of ethnic superiority not shared by other Asians — in the same way British Imperialists believed noone shared theirs). This was an incendiary cocktail set to be so manipulated and then ignited by 20th-century militarists. Meanwhile, after the slump in his arms trade, Glover also turned to coal mining, putting in increasingly torturous hours on the small island of Takashima, only to suffer bankruptcy in 1870 through a combination of bad luck and desperate accounting. 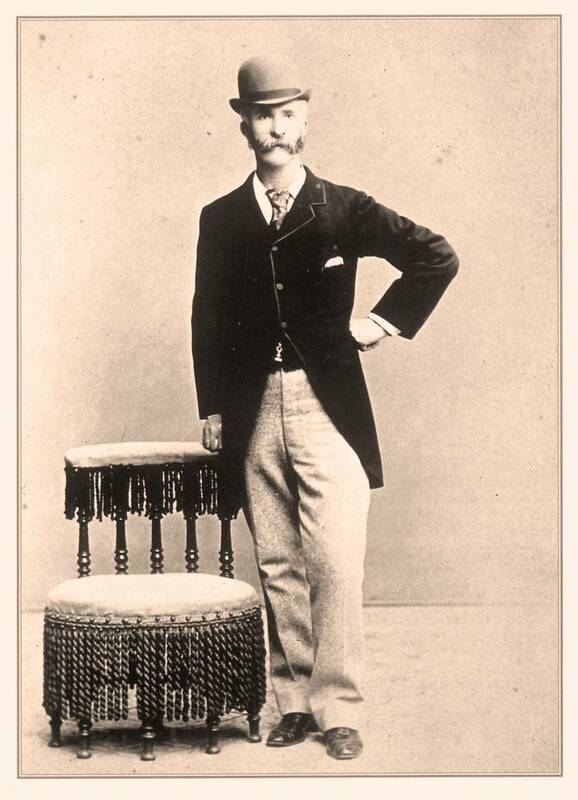 Although the new Dutch owners of the mine kept him on as manager, his big peacetime break came when he was recruited in 1874 by his near contemporary, Yataro Iwasaki, the scion of a Tosa-clan former samurai family in Shikoku who had recently set up a shipbuilding business. In 1873, Iwasaki renamed his business Mitsubishi — forerunner of the now-global Mitsubishi conglomerate — and to the enterprise Glover brought not only his expertise but also considerable funds. And of course both men had close connections with the network of former samurai behind the Meiji government that was to stay in place until the Emperor’s death in 1912, and who were happy to pass contracts — especially for warships — their way. Glover’s new salaried position, more or less as a shipbuilding consultant, allowed him to bolster his profile and also work on some of the side projects for which he is now sometimes better known. Among these was the apparently impossible business of brewing and selling beer in a country where it was virtually unknown. Nonetheless, it is no mere urban myth that the design of the Kirin beer-label motif to this day features his mustache, since the original sketch was made by his daughter, Hana, and Glover was one of the prime movers and early directors of the Japan Brewery Co. from which Kirin Brewery Co. evolved. Increasingly though, the rise of the Imperial Japanese Navy, and the authoritarian turn the state was taking, came to worry Glover, as it did the liberal management of Mitsubishi. Although he never seriously considered returning to Scotland, in the early 1880s he moved with his brother Alex to the new untamed frontier of Washington State for two almost undocumented years. With Glover gone, the openly Anglophile Ito was worryingly looking to Prussia for a constitutional model, since (despite studying at University College London as one of the Chosu Five) he could find no British written Constitution — unsurprisingly, as no such thing existed or exists to this day. By the mid-1880s, however, Glover had returned and was settled between Nagasaki and Tokyo with a wife of unusually long standing for the time and a son he had “reclaimed” from a previous partner. 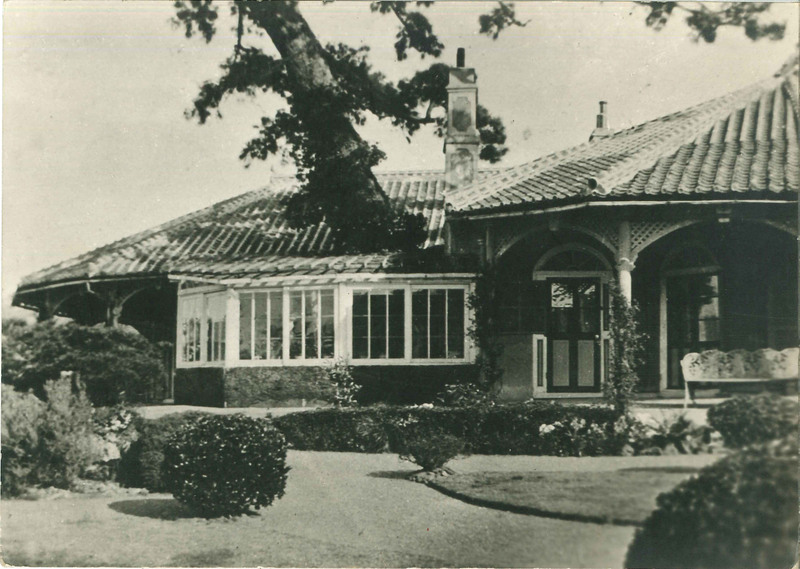 From the late 1880s till the failure of his health in the mid-1900s he increasingly spent his time in his opulent house in Azabu, where even in semi-retirement he continued brokering between local politicians and foreign residents at a time when tensions were not only still high, but also sometimes increased by Japan’s growing power in the Pacific that culminated in its victory over Russia — one of the established Great Powers — in the countries’ 1904-05 war. 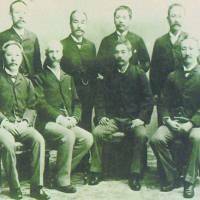 Though Glover’s free-trading achievements were to figure in an horrific legacy of collateral damage, they did doubtless greatly help to propel the progressive course of Meiji Era Japan and beyond. Whether “progressive” is the same as “good” is a much more complicated question; as is the question of to what extent Glover was just an outstanding but soulless opportunist. Whatever the value judgments of the man, however, what is certain is that, at a time when traders took self-reliance, laissez-faire and their home countries’ gunboat diplomacy for granted, Glover contributed to the overthrow of the shogunate and the establishment of Japan’s international relations in quite concrete ways — whether as an arms dealer or a freelance quasi-diplomat. In this latter regard, his massaging of a Satsuma-Choshu-Britain summit in 1865 was perhaps his single most important accomplishment, since it helped forge a rapport between the clans which, in turn, encouraged the British government not to step in to stop their rebellion or the sale of arms. Later, too, Glover would be an important “pro-Japan” lobbyist — most notably through the British courtier and politician Lord Charles Spencer, of the Lady Diana line — adding to the impetus behind the 1902 Anglo-Japanese Alliance, which headed off potential problems for Britain during World War I. By that time, however, and even more so after the victory over Russia in 1905, Glover — while publicly supporting Japan’s imperial ambitions — was becoming privately ambivalent about the speed of the military buildup. Indeed, it was to lead to an expansion which would eventually set the new Empire of Japan against the old Western trading powers and end in the suicide of his own son in post-bombing Nagasaki. If the Glover story does show how the Foreign Office in London tended to stand back to let traders lead, only to then write those same traders out of the official histories, it also shows clearly how foreign policy operated within the imperial understanding of free trade. In this sense, the timing of Glover’s stay is crucial: The year of the Restoration, 1868, also saw the floodgates open to Enlightenment ideas, as well as the publication of Charles Dilke’s influential imperial tract “Greater Britain,” which argued for an Anglophone empire based on language and culture rather than military power alone — and was itself a reaction to the expense of maintaining imperial power after the Indian Rebellion of 1857 and the Morant Bay Rebellion in Jamaica in 1865. A glance at the spread of the new Meiji Era universities, many evolved from English schools, and later highly mimetic fashions, also shows how this shift was registered in Japan — and by mid-Meiji Era editions of “Greater Britain,” Japan had been included. This was the moment Glover inhabited; he grasped how it worked and played skilfully within its parameters. More widely, his success fell within a period when the universalizing of certain specific values was normal. Universalist Scottish-Enlightenment modes of progressive thought were particularly welcomed by an ambitious new Japan around the time of opening, from Nakamura Masanao’s 1872 translation of John Stuart Mill’s “On Liberty” to Nishi Amane’s rationalist and encyclopaedizing “Seiji Jijo” (1866-70) and Fukuzawa Yukichi’s “In Praise of Knowledge” (1872-76). In fact, much of what was taken as axiomatic following the Meiji Restoration originally belonged to the Scottish Enlightenment, and was transmitted at a time when imperial free trade had given Scotland a means of expression within the British state. As such, the globalizing choices faced by Glover’s Japan had been faced by Scotland around a century before, and both countries in their turn came to see that they had to compete aggressively within, or through, empire to avoid being swallowed up by a new order. In the case of what historians term the First Scottish Enlightenment, Adam Smith and David Hume brought philosophical skepticism and free-trade ideals; in the case of the Second Scottish Enlightenment, Thomas Carlyle and John Stuart Mill added individual responsibility, heroism, and freedom. Both were imported enthusiastically around the time of the Meiji Restoration, and both fed into the heroic, ethnic, trade-based empire-building Japan embarked upon. Most assessments of Glover, nevertheless, fail to address the importance of the outward push of empire and of social class that he so effectively ushered into the corridors of Meiji Era power. Firstly, the British Empire had demanded a typology of race (Brits on top; others in need of civilizing, benevolently or otherwise) that would be drawn on by Meiji conservatives as if it were natural and universal. 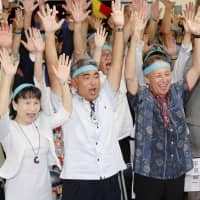 In due course, this was to amplify Japan’s sense of an Imperial civilizing mission, while following the humiliation of World War II it would again resurface to amplify a face-saving myth of Japan’s separateness. This conception of race had largely been invented in Edinburgh (the famed medical school’s anatomy was key) in the 1840s and ’50s, and was typical of a peripheral region that had been humiliated and had lost government power (following failed rebellions in 1715 and ’45) and was after new universalizing, rationalist, managerial guidelines — the Scottish Enlightenment — to help them spread into empire. Imported at a very rapid pace in the Meiji Era and, translated into samurai terms, this typology became a principle for the free-market civilizing mission that was the Japanese empire. Additionally, in terms of social class, the Meiji opening of their country was attractive to Glover’s allies in part because it allowed for the easy translation of an existing caste system in which samurai were on top as if by divine right, to a class system in which the same samurai ruled as by managerial merit. 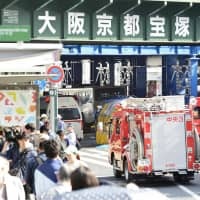 To this day, indeed, there remains in Japan a powerful mix of finance and officialdom — just as in fragmenting Great Britain. In such ways, Enlightenment Japan did indeed mirror Enlightenment Scotland — and the pioneering Glover did indeed define a particular form of progressivism despite his modus operandi being virtually that of today’s rogue finance traders who stretch and endanger their institution to the point they are left virtually acting alone. In a fundamental sense, though, was Glover ever really pushing the envelope of free-market mercantile morality very far? After all, he owed his position as a pioneer trader to Jardine Matheson, a company that was able to flood China with opium and arms with little resistance, one that lobbied for the Opium Wars and was at the center of what would in the 20th century be called a military-industrial complex. And as for the “free” in free-market morality, of course it was bogus as it relied on British military might and the all-powerful Royal Navy in particular. In this respect it may be that part of Glover’s contemporary significance stems from that desire he personifies — to free markets from a state-sponsored investment thinking which simply draws money to money — and turn them instead toward serving freely chosen interpersonal exchanges of goods. This is significant in our own environment, where bubble economies continue to prevail. However, there’s an anomalous legacy of Glover and his ilk, too, thanks to the persistence of a mid-Victorian typology of discrete ethnicities with which he would have felt quite at home. Hence, in the received wisdom of today’s Japan, Glover’s fame has slipped far below that of the Tosa revolutionary Sakamoto Ryoma, despite the latter quite likely having been less influential in bringing about the Meiji Restoration. But Sakamoto is now better remembered, not because of Glover’s dubious dealing, but because he is imagined to better encapsulate the modern Japanese spirit. Yet more anomalously, if there is such a thing as a modern progressive Japanese spirit, the course of Glover’s pragmatic and flexible career would be a fairly good example of it — accepting vested power for what it is, while acting like a militant liberal quite often. In this form, that spirit takes in the attitudes of samurai like Sakamoto, Ito and Godai in the same way Glover was as power-driven and as dismissive of weak will and empty bureaucracy as those of samurai stock whose company he shared. And just as Glover’s aggressive free-trading came with a sense of destiny and a civilizing mission, so too did Japan head off on that route — a route that these days tends to follow the course of globalization in competitive, strategic and unequal modes. Michael Gardiner is the author of “At the Edge of Empire: The Life of Thomas B. Glover” (Birlinn, Edinburgh; 2007).